A former marriage and family counselor, Ms. Cook has supported families during their most difficult times for more than 30 years. Making the natural progression into law, she now provides unmatched legal counsel to those in need, and she has achieved notable success helping her clients resolve their conflicts and reach agreements as efficiently as possible without the need for expensive, protracted court battles. Should your case need to go to court, however, she will be right there beside you to provide the advocacy and support you deserve. Her clients appreciate the time and energy she puts into helping them, and she is proud to have made such a positive difference in the lives of so many. Her warm and welcoming demeanor does not belie the aggressive approach she will take to ensure the best odds of achieving the positive results you expect, and she is fully committed to protecting your rights and best interests as well as those of your children throughout negotiations and all other legal proceedings. 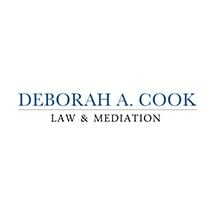 To receive a free telephone consultation concerning your matter from a local attorney you can trust, you can contact Ms. Cook at her law office Deborah A. Cook, P.A., to schedule an appointment.